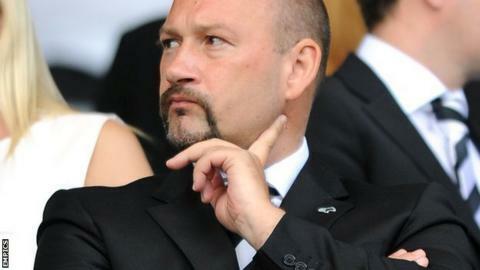 Head coach Steve McClaren has described chief executive Sam Rush as the "glue" that holds Derby County together. Rush, who was appointed in January 2013, was voted CEO of the year at the Football Business Awards on Thursday. And McClaren told BBC Radio Derby the recognition was well deserved. "He has to pull everybody together and he is the glue in that. It is a very important job and he gives the head coach the freedom to do his job properly," McClaren said. Rush was presented with his award at the Football Business Awards at Chelsea's Stamford Bridge. It was voted for by the chief executives of clubs in England's top four divisions and the Scottish Premier League. "The key thing is when you sit down with him he says 'what do you need next? What do you need now? What do you need to improve? What do you need for the players? Do you need any players? What can we do to help?'" "He has a difficult job," said McClaren, who last season took the Rams to the Championship play-off final and has guided them to fourth in the table this season. "He has to deal with owners, crazy managers, fans - and that is hard. There is a lot pressure but he does the job very well. "You suggest things and off he goes and he gets the job done - that's the biggest thing, he gets the job done." McClaren added: "He glues everybody together; the head coach, the players, the staff on the football side - together with the commercial side, the administration, and the fans and supporters' clubs. "In a football club that is growing and doing well, the relationship is good but it's during the bad times that it will be tested. There have been a few of them, but I have had nothing but backing."